Tufted silk walls complement furnishings in champagne fabrics and pale pumpkin tones of wood. Ms. Hatos loved to carry her fur throws around the house. From them, we designed the color scheme. The classic Pebble Beach style fireplace wall was paramount in selecting the furnishings. Each textured element was chosen for the way they captured the light and felt to the touch. Ms. Hatos has the style for luxury, like the classic Hollywood movies. She often described her taste as champagne, champagne, champagne! It was not only her favorite color for her interior finishes but her favorite style of dress. If it was luxurious, elegant, glamorous and champagne in color, she would usually adore it. 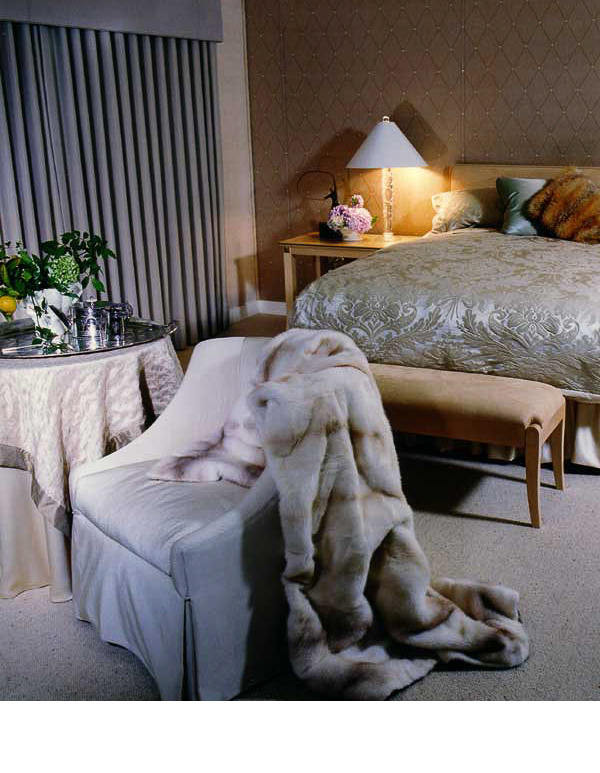 Mixing textures of fur, silks, brocades and wood tones gave a luster of elegance in this private sanctuary. Quilting the walls with silk, adding elegant surfaces, elimanting the need for excess furniture original to the home and paying close attention to the design lines of furnishings we chose at a minimum, all provided a very different interior. Our primary goal in the living room was to provide warmth and beauty in the textures we used, akin to the pine trees and natural habitat surrounding her home.